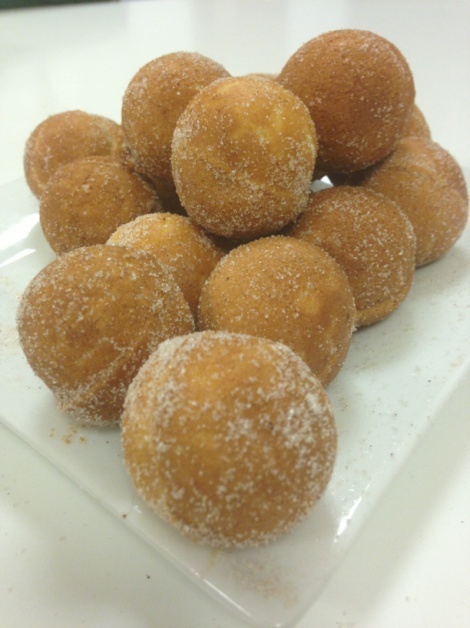 Doughnut Balls- for use with Gourmet Gadgetry Cake Pop Maker! 1. Add the softened butter and sugar to a large mixing bowl and beat until light and fluffy. 2. Next beat in the egg and vanilla essence to the mixing bowl. 3. Add the salt and baking powder to the bowl and mix in. 4. Gradually sift and mix in the flour. 5. Add the milk and mix all of the ingredients until they come together to form a smooth batter. 6. Make sure that your Cake Pop Maker is pre-heated and that each cavity has been coated with an oil spray. 7. Add a dessert spoon sized amount to each cake pop cavity on the bottom baking plate. 8. Carefully close the lid and allow the doughnut pops to bake for 4-5 minutes. 9. You can test that the doughnut pops are ready by inserting a toothpick into the middle of one; if it comes out clean they are ready. 10. Switch off the machine and leave to cool for a few minutes before removing with a wooden or plastic utensil. 11. Whilst the doughnut pops are warm roll them in a mix of sugar and cinnamon. This will lightly coat the pops and add a sweet, delicious flavour!